The choice of reliable, reputable online loan companies that offer good rates, high-level customer service, and fast turnaround times for personal loans is greater than ever. 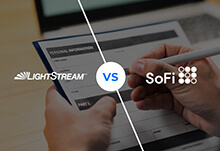 We put SoFi and Marcus head to head to evaluate their application process, loan terms, eligibility requirements, fees, security, and customer service so that online borrowers can choose which one is best for them. SoFi offers secured home equity loans and unsecured personal term loans for any purpose, for amounts up to $100,000. One of the best aspects of borrowing through SoFi is its flexibility. You can also change your monthly payment date at any time if you choose. There are no hidden fees or origination fees and even the late payment fee of $5 or 4% (whichever is lower) isn’t charged until after a 15-day grace period and will be waived if you generally pay on time. SoFi prides itself on being more than just a lending platform. If you lose your job and find it difficult to keep up with payments, you can request to suspend payments for 3 months at a time for up to 12 months and SoFi will use its members-only networking support to help you find a new job. SoFi is ideal for anyone with excellent credit who needs a flexible, alternative personal loan. Marcus is a new lending platform supported by the reputable Goldman Sachs investment bank. It provides unsecured small personal loans of up to $30,000 for a range of purposes, not including education, although it’s focused on borrowers needing to consolidate debt. Marcus doesn’t charge any fees, including origination fees, personal check processing fees, or even late fees and there is no charge for early prepayment. The best part about borrowing through Marcus is the flexibility. You can choose your preferred monthly repayment amount and loan term on the website and Marcus will design a loan around those requirements. Once you’ve made 12 monthly payments on time, you can skip one payment. It will extend your loan term by one month but won’t add to the amount of interest you’ll need to pay. APR rates with Marcus begin at 6.99% for applicants with excellent credit and loan terms are flexible, between 36 and 72 months. Marcus is ideal for borrowers with excellent credit who want to escape high fee loans. SoFi checks out borrowers carefully so there is a longer application process involved and it takes longer to get funding through. The initial pre-approval application takes around 10 minutes and covers basic questions about your financial history, credit score, and employment situation. SoFi runs a soft credit check that won’t affect your credit standing to verify your credit score. After the initial application, you’ll be approved for a longer vetting process that asks for more specific details. Once your loan has been approved, you’ll learn the terms and can then get the funding. All in all, applying through SoFi takes around a week for the money to arrive in your account. Although Marcus is provided by established bank Goldman Sachs, the application process is fully online. To apply, you select the loan term and the monthly amount that you want to pay on the Marcus website. Marcus will put together a loan offer that's best for you. It runs a soft credit check with TransUnion to check your credit standing without affecting your credit score before approving you. Marcus will also check the purpose for which you want the loan and your average monthly income. Time to funding is very short; you'll usually receive your money within two business days, although it can be as little as the next working day. Marcus and SoFi’s loan terms are both fairly similar. 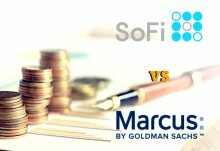 Both have a loan repayment period beginning at 36 months, although SoFi’s stretches to 84 months while Marcus’ longest repayment period is just 72 months. SoFi does offer a much higher maximum loan amount of $100,000 to borrowers that qualify, while Marcus’ top loan amount is only $30,000. However, Marcus lets you borrow from $3,500 while SoFi offers loans from $5,000. APR rates are lower with SoFi, beginning at 5.99% - 28.99% in contrast to Marcus which begins at 6.99%. In terms of eligibility requirements, Marcus requires an established credit history, while SoFi is willing to waive this. Both SoFi and Marcus require that you be over 18, of legal age to take a loan in your state and a US citizen. Both lenders also require borrowers to have a job. SoFi and Marcus both keep the best rates for borrowers with excellent credit, but SoFi doesn’t have any minimum years of credit history or ask for a maximum debt-to-income ratio. 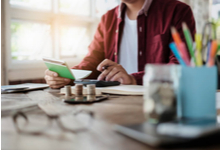 It’s willing to work with new borrowers who don’t have any established credit history and will consider them according to their financial history, expenses, income, and career experience. Marcus doesn’t say how long a credit history you need but makes it clear that it’s not for new borrowers. It also asks for a debt-to-income ratio of below 40%. Both SoFi and Marcus shine when it comes to fees. Neither lender charges any origination or signup fees, personal check processing, or early repayment fees. SoFi charges just $5 or 4%, whichever is lower, as a late payment fee and there is a 15 day grace period before it’s charged. If you usually make your payments on time then it will most likely be waived. Marcus doesn’t charge any fees at all, not even any late fees, although interest will continue to accumulate so your final payment will be higher. SoFi prides itself on offering plenty of educational resources. There is a good FAQ section and a number of financial calculators and other resources to help users compare and check up on loan rates and costs. There are also support sections for furthering your career. SoFi offers member-only networking events and assistance programs to help entrepreneurs and support customers who loses their job during their loan term. SoFi customer support is available by email 24/7 or by telephone during working hours. Marcus has a full FAQ section and award-winning customer support via email or telephone, aiming to answer all calls with a live representative within 10 seconds. SoFi and Marcus both have reliable privacy policies and are transparent about the data they gather. Marcus is backed by the reliability of Goldman Sachs bank. Both promise not to share your data with third parties and have encrypted secure loan platforms to protect your data from hackers. SoFi and Marcus are remarkably similar loan platforms. Both of them offer good APR rates and loan terms with low fees, flexible repayment options, and similar eligibility levels. SoFi shines when it comes to educational resources and edges slightly ahead with lower APR rates, higher maximum loan amounts, longer terms, and more flexibility about your loan purpose. However, Marcus pushes back with zero fees, a faster application process, and award-winning fast customer support. Your choice for best lender between SoFi and Marcus will probably come down to what you want the loan for and how good your credit standing and loan to income ratio is. Either way, you can expect good customer support, flexible repayment, and high security.